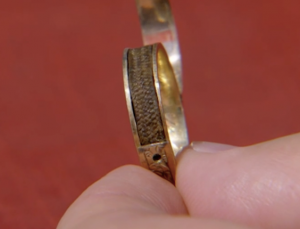 Woman Finds Ring Filled With Charlotte Brontë’s Hair, Is Now $26,000 Richer and Reminds Us That Hanging On To A Dead Person’s Hair Was A Common Practice Back In The Day. Lauren Evans from Jezebel writes about this Antique Roadshow find. In its nearly 30 year history, Antiques Roadshow has made some people very happy they decided to clean their disgusting attics. Sometimes the results are surprising. Sometimes, they’re a little too…surprising. I’m not sure what the woman who appeared on last night’s episode bearing a ring inscribed with the words “C. Brontë” was expecting, but I think it’s safe to say she got what she wanted.